This article originally appeared in Real Clear Markets on October 11, 2017. Last week the Washington Post offered a harsh portrait of the “new reality of old age in America.” Its reporters described the pinched circumstances of older couples searching for temporary work in order to top up their meager Social Security checks. A 74-year-old tells readers “I’m going to work until I die, if I can, because I need the money.” The Post reports the stories of these struggling job seekers with warmth and compassion. The stories reflect a bleak reality facing some aged Americans, those whose retirement incomes are scanty and whose retirement years are anything but golden. The broader reality, however, is that economic deprivation in old age is increasingly rare. Over the past several decades the material circumstances of America’s elderly have improved, both absolutely and relative to the circumstances of the nonelderly. Contrary to the implication of the Post story, the current reality for most older Americans is that old age is more comfortable and longer lasting than it was for earlier generations. Over the past several decades the material circumstances of America’s elderly have improved, both absolutely and relative to the circumstances of the nonelderly. Careers nowadays last beyond age 65 for an increasing number of workers, but the evidence suggests delayed retirement is more common for those with college degrees and advanced diplomas than it is for the less educated. Many of us remain employed later in life as a result of choice and conviction rather than necessity. As a result, the surge in late-career earnings has tended to boost the incomes of the most affluent elderly, thereby increasing old-age inequality. To be sure, public and private institutions that should assure workers a comfortable old age leave big holes in worker protection. Several of these receive well-deserved criticism in the Post’s story. Too few wage earners are given the opportunity to save for retirement at their workplace. Many employers offer retirement plans with inadequate incentives to save or a lousy menu of saving options. On the whole, however, both public and private retirement programs have delivered steadily rising living standards and falling poverty rates to the population past 65. According to Census statistics, the inflation-adjusted income of the median family headed by an older American increased 64 percent between 1979 and 2016. In comparison, among households headed by someone between 35 and 44, median income edged up just 9 percent. Over the same period, the poverty rate of older Americans fell almost 6 percentage points, while poverty rates among children and nonaged adults increased. Under the official poverty guidelines, the poverty rate among the elderly (9.3 percent) is now noticeably lower than it is among children (18.0 percent) and nonelderly adults (11.6 percent). While the Post article describes a tough, hand-to-mouth existence for the aged workers it profiles, the story fortunately describes the situation of a shrinking percentage of older Americans. A better piece of reporting would have alerted readers to this key fact. The incomes of the aged are actually higher and improving faster than Census statistics suggest. The best known income and poverty numbers are based on an annual Census Bureau survey. Unfortunately, respondents’ answers in the survey give a misleading picture of the incomes flowing into families headed by retired breadwinners. The problems of the interview responses have been known for some time. The Census survey gathers reasonably accurate information about income from wages and Social Security, but it collects much less reliable data about interest and dividends, workplace pensions, and withdrawals from retirement savings accounts. Further, pension underreporting has grown worse over time, leading to a growing understatement of retirees’ incomes. 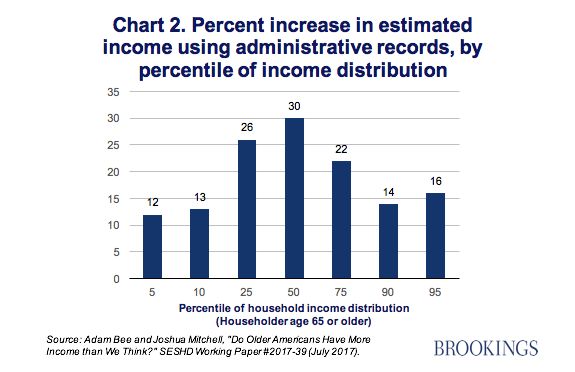 Two Census Bureau statisticians, Adam Bee and Joshua Mitchell, recently compared household income reports in the Census survey with the income records compiled by the Social Security Administration and IRS. Their paper compares interview responses on the Census Survey to administrative income reports for five key income sources – earnings, Social Security benefits, Supplemental Security Income (SSI), interest and dividends, and income from workplace retirement plans (including IRAs). They find that earnings and Social Security benefits are well reported in the survey while the other three income sources are seriously understated. In 2012, respondents past 65 failed to report more than one-quarter of their SSI benefits, about one-third of their interest and dividend income, and over half of their workplace pensions and retirement savings plan withdrawals. The underreporting of workplace pensions and other income items has grown worse in recent years. According to the Census Bureau’s income survey, only 40 percent of Americans past 65 received a workplace pension or withdrew funds from a retirement savings account in 1990, and this percentage shrank to 36 percent in 2012. In contrast, the IRS administrative records show that the fraction of aged respondents receiving pensions and savings withdrawals climbed from 45 percent to 61 percent over the same period. One reason that so many observers are gloomy about the workplace retirement system is that they accept without question the income amounts reported on Census surveys. When the erroneous income reports are corrected, both the income levels and the income trends are much more encouraging. As colleagues and I also discovered in an earlier research project, Bee and Mitchell find that income underreporting is a worse problem for respondents past 65 than it is for younger respondents. The reason is simple: Income items that tend to be underreported account for a bigger percentage of older respondents’ total incomes. This implies that the relative well-being of the nation’s elderly is much closer to that of the nonaged than one would conclude based on Census survey estimates. Bee and Mitchell’s new analysis allows us to pinpoint the population groups for which underreporting is a major problem. 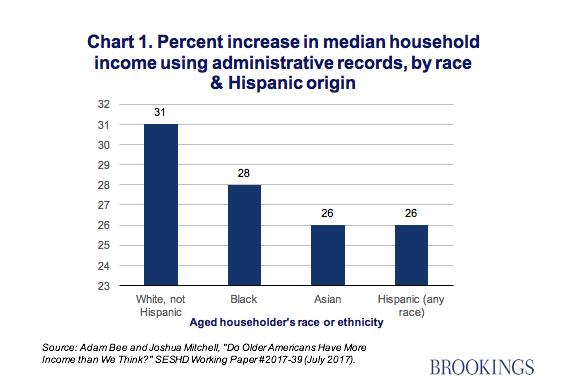 When corrected income amounts are substituted for incorrect survey responses, the median income of aged households increases by similar percentage amount across all races and ethnic groups. While income underreporting is significant at both the top and bottom of the old-age income distribution, its biggest impact is in the middle (Chart 2). The two analysts find that, when incorrect survey responses for 2012 are replaced with more accurate Social Security or IRS reports for the same year, the median cash income of aged households increased from $33,800 to $44,400, a rise of 30 percent. Measured income at the bottom of the distribution increased, too, but by a smaller proportional amount. Even so, Bee and Mitchell find that the estimated old-age poverty rate in 2012 fell by more than 2 percentage points when incorrect survey responses are replaced by correct income amounts derived from administrative records. Over the past half-century trends in the well-being of America’s elderly have been more favorable than has been the case for any other age group. The income poverty rates of the aged have declined sharply, their health insurance coverage is broader and more secure than it is among the young, and their incomes have continued to improve, even as the incomes of many younger age groups have stagnated. Fueling the income gains of Americans past 65 have been increases in their employment rate and an improvement in their weekly pay relative to that earned by young and prime-age breadwinners. Whether the gains of the elderly can be sustained is an open question. Nonetheless, their relative and absolute economic gains in recent decades are impossible to deny. Will Less Incarceration Mean More Social Mobility?